A spacious 74 square-meter apartment with a large hall and cloakroom. 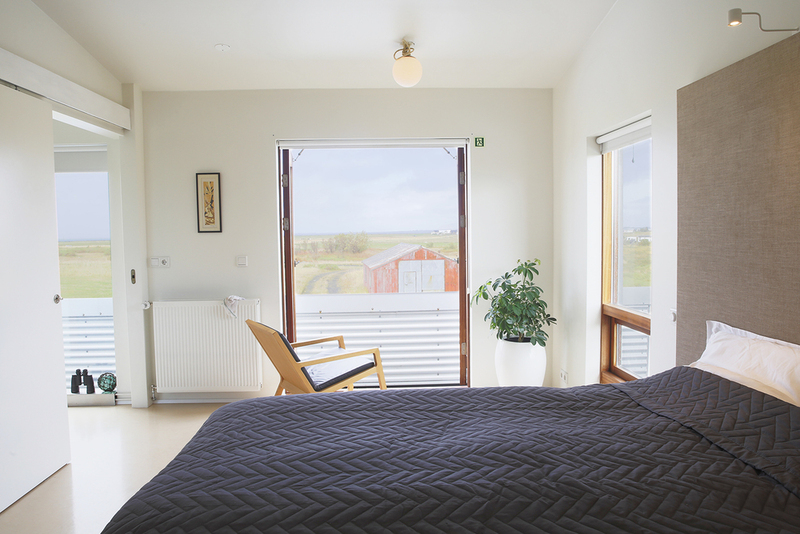 Bedroom has a king-size bed, a wardrobe and a beautiful view of Reykjavík and its surroundings. There is a well-equipped kitchen and table for four. The living room is spacious with comfortable furniture, an antique fireplace, a smart-TV, a skylight window and a view of the garden. The living room offers direct access to the garden and there is a small terrace adjacent to the exit. It it possible to add extra beds for a nominal fee. Children’s cots are available upon request. Children under the age of 12 stay free of charge. A 54 square-meter apartment with a beautiful view and high ceilings. Bedroom has a king-size bed and good storage for apparel and luggage. There is a balcony off the bedroom with a wonderful view of nature, the surrounding mountains and over the city of Reykjavík. Simple kitchen facilities are available, as well as a dining area. There is a small living room with a sofa and smart-TV. It is possible to add extra beds for a nominal fee. Children’s cots are available upon request. Children under the age of 12 stay free of charge. A 33 square-meter apartment with a beautiful landscape view and high ceilings. Bedroom has a queen-size bed and good storage room for apparel and luggage. There is a spacious bathroom, kitchen facilities as well as a small living room area with a sofa and smart-TV. Bright 13 square-meter room along with spacious, well-equipped living room, totalling 33 square-meters. The bedroom is bright with large closets and a private sink is in the room. The room has double-bed and a nice view of the presidential residence at Bessastaðir, the mountains and the city of Reykjavík. The shared living room has a sofa, smart-TV and a dining area for four. The entrance is off of the breakfast hall. The shower and toilet are shared with one another room and is accessible from the breakfast hall. Bright and spacious 18 square-meter room, with a double-bed and one single bed. A nice view of garden, birdlife and village. The room shares a well-equipped living room with one other room, which has a sofa, smart-TV and a dining area for four. The shared living room has a sofa, smart-TV and a dining area for four. The entrance is off of the breakfast hall. The shower and toilet are shared with one another room and is accessible from the breakfast hall. The breakfast room is located in a bright garden pavilion where breakfast is served from 8-10am. If ordered the day before you can have a breakfast tray delivered to your apartment or room. The garden pavilion is also a common space for our guests to use with great views in all directions and access to our a large garden. The phone is located in the hall for emergency calls and local landlines calls, free of charge.